Cookie Monster-love him and cookies! 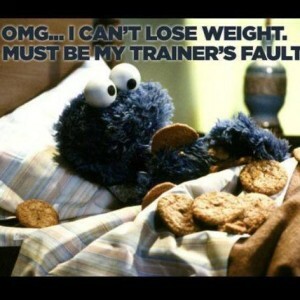 I love this photo and I instantly realized that I would love to be Cookie Monster or Alistair Cookie’s trainer, happy to be at ‘fault’. Cookie Monster is a such a lovable and funny character-I fail to see how human weight ideals apply to him, as he is a furry blue monster! I would join him in shoveling vast quantities of cookies towards our faces and making a big mess in general-we could do lots of speed, endurance and clean up training specific to…cookies!! This entry was posted in commentary, Vivian Law and tagged Cookie Monster, healthy eating habits, Vivian Law. Bookmark the permalink. “Today me will live in the moment unless it’s unpleasant in which me will eat a cookie.” -Cookie Monster. Lovable and funny? Do you have any idea how much Cookie Monster has contributed to childhood obesity? I’ve struggled with this addiction my whole life and it all started the first time Cookie Monster got me shoveling vast quantities of ‘C’ into my mouth. Vivian, clearly you’re just a shill for ‘Big Cookie’ – Nabisco, Mrs. Fields, the Girl Guides and those damned little scheming Keebler elves! Thank you for your comment. I do not believe that Cookie Monster has contributed to childhood obesity. Sorry to hear of your addiction that sounds like it started with emulating Cookie Monster. ‘Shoveling vast quantities of cookies towards our faces’ is what I would join Cookie Monster in doing. However, the shoveling action is playful and NOT actually ingesting vast quantities of cookies. I have always felt that he does not actually eat the cookies, especially since the cookies are always still there, just in a mess of crumbs. I am a ‘shill’ for homemade cookies and they are made for eating enjoyment. None of the brands you mention have been recommended on my website.